Blepharoplasty (eyelid surgery) refreshes the appearance of the eyes by removing excess skin from the eyelids and eliminating signs of aging and fatigue. Manhattan and New York City blepharoplasty patients can opt for upper or lower eyelid surgery or a combination of the two based on their needs. Dr. Mark Albert is a plastic surgeon in NYC who has experience in a variety of approaches to blepharoplasty, including both surgical and non-surgical techniques to improve the aesthetics of the eyes. He applies this breadth of knowledge and skill to give patients outcomes that are both attractive and in harmony with their other facial features. Your eyes not only allow you to see the world but also allow the world to see you: the expressions you share, the emotions you feel, and the connections you want to make. However, your eyes may share the wrong traits—fatigue, lack of rest, premature aging—if you have excess and sagging skin, crepey skin, or large bags under your eyes. Blepharoplasty gives you a chance to share a youthful and alert appearance. Upper blepharoplasty addresses skin that hangs from the upper lid, which can hood and obscure the outer part of the eye. The plastic surgery may also eliminate excess fat adjacent to the nose. Lower blepharoplasty removes excess skin and bags from below the eyes. In addition, it can tighten loose skin, eliminate unwanted areas of fat, and improve a crepey appearance. Dr. Albert can help patients determine whether one or a combination of procedures will achieve their desired outcome. During your initial consultation, your plastic surgeon Dr. Albert will ask you about your specific concerns so that he can recommend the procedure that will best address your needs. He will also examine your eyelids, take a medical history, and learn about the health of your vision to determine if you are a good candidate for blepharoplasty. Manhattan and New York City patients who have eyelid ptosis can still have the procedure, but Dr. Albert will need to take certain steps to achieve the best outcome. Patients who have dry eye syndrome may benefit from a different aesthetic treatment besides blepharoplasty to promote the health of their eyes. He will remove excess fat and skin to make the eyes look more youthful and rested. For a natural and refreshed appearance, he will ensure that the skin is smooth without appearing tight and that eyes look alert but not wide open. He will create smooth transitions between the cheek and eyelids. This may include fat grafting or using aesthetic lasers to blend the features softly. Thanks in part to this approach, Manhattan and New York City blepharoplasty surgery patients report a high level of satisfaction with their results. As with all of his aesthetic work, Dr. Albert is one of the top plastic surgeons in NYC and brings extensive training and experience to the procedure and a commitment to helping patients become their best selves. Manhattan and New York City patients who only have an upper blepharoplasty can be awake throughout the procedure under local anesthesia. Typically, Dr. Albert can conduct the surgery in-office, and the process will take about 20-30 minutes. Lower blepharoplasty patients usually receive general anesthesia for their comfort and safety. If Dr. Albert is not removing or repositioning fat during surgery, he can perform the procedure with local anesthesia alone. 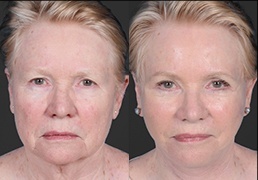 Lower blepharoplasty takes approximately 45 minutes to one hour to complete. To prevent hollowing, he may use a fat grafting technique that adds fullness beneath the lower eyelid and naturally blends the area around the upper cheek. Sun damage or muscle slackening can cause the development of malar bags and festoons (swollen mounds along the upper cheeks). Dr. Albert can treat these areas to give them a smoother appearance. In some cases, Dr. Albert will use a laser to eliminate fine lines, improve crepey skin, or tighten the lower lid. This offers a less invasive, safe, and lasting alternative to surgery. After the procedure, Manhattan and New York City blepharoplasty patients will receive dressings to cover the incision sites and to minimize the appearance of scars. If you have laser treatment, Dr. Albert may place ointment on the sites to improve healing. You will likely have swelling for about one week following your blepharoplasty. Dr. Albert will remove the sutures 5-7 days after the procedure, and most patients will return to work at this point. By the time you have fully recovered from surgery, you can expect to enjoy a refreshed and natural-looking appearance. Rejuvenate your eyes in an attractive and subtle way. Manhattan and New York City patients can learn more about blepharoplasty by contacting Dr. Albert online or by phone at (212) 203-8623.